H321. 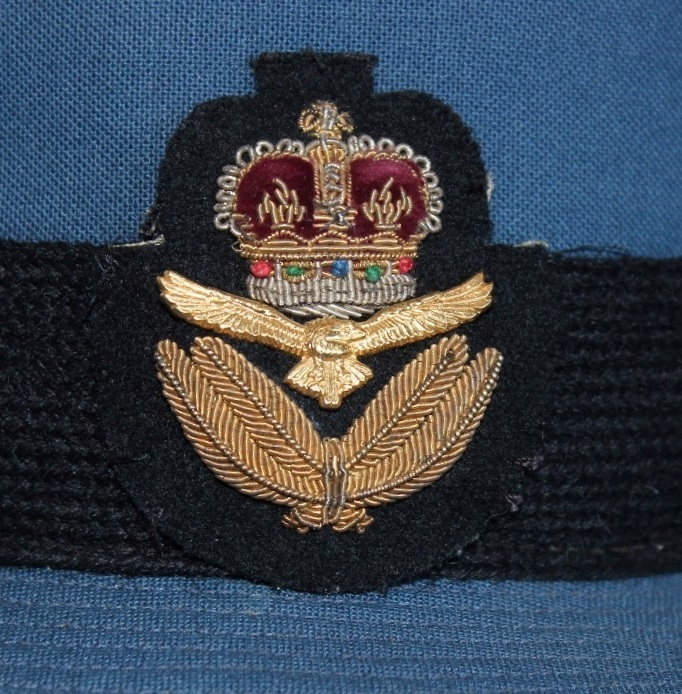 An unnamed and undated Air Training Corps Under Officer service dress cap with an anodised cap badge. 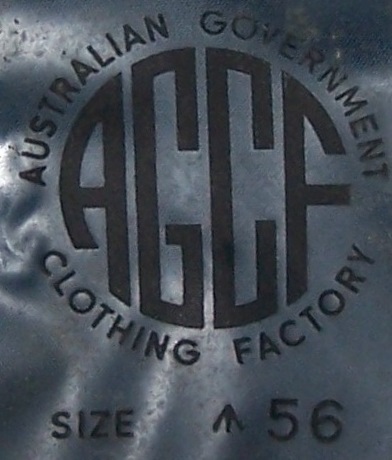 The cap is lined with a blue/grey material and is covered with thin plastic which is stamped Australian Government Clothing Factory (AGCF) size arrow 56. 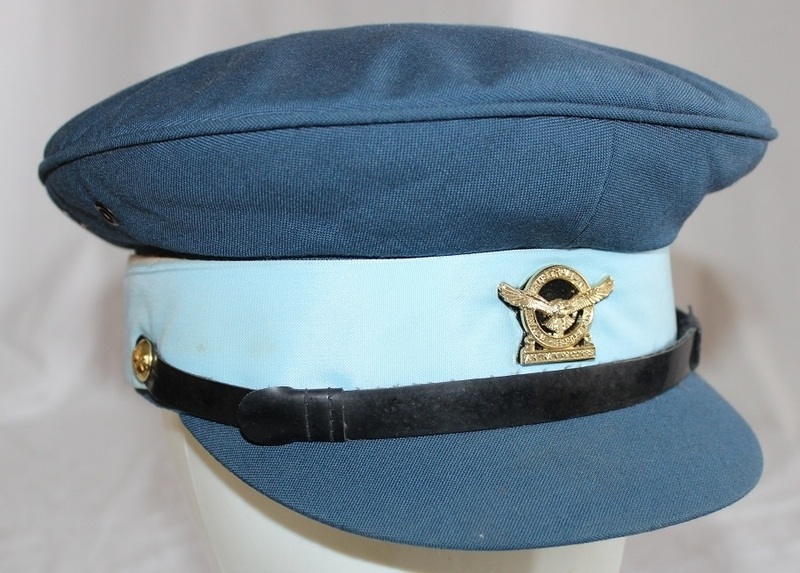 The sweatband is foam backed vinyl, the hat band is sky blue nylon over a white flannel and the vinyl chinstrap is held in place by 2 gold plastic RAAF buttons. H321. 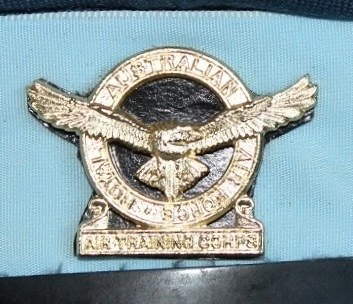 Gold anodised Air Training Corps cap badge. H321. Blue/grey material liner with makers stamp. H321. A.G.C.F. stamp on plastic liner. H349. 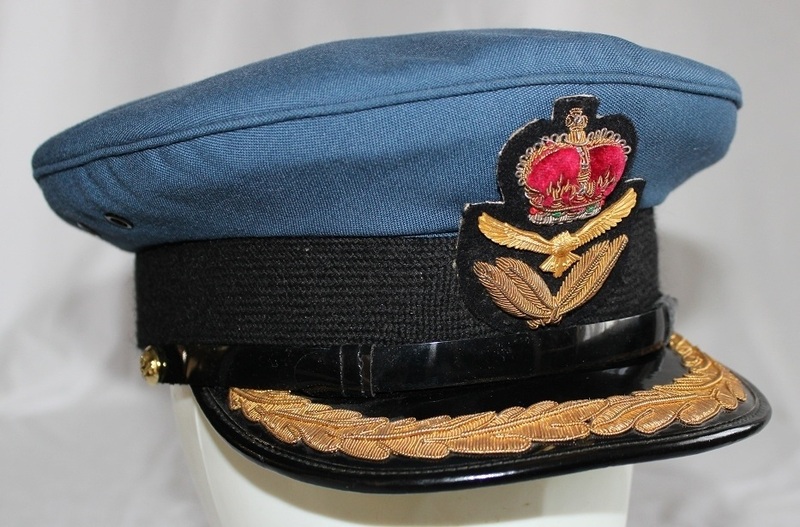 A Group Captains service dress cap named to P Newton with a gold bullion officers cap badge. 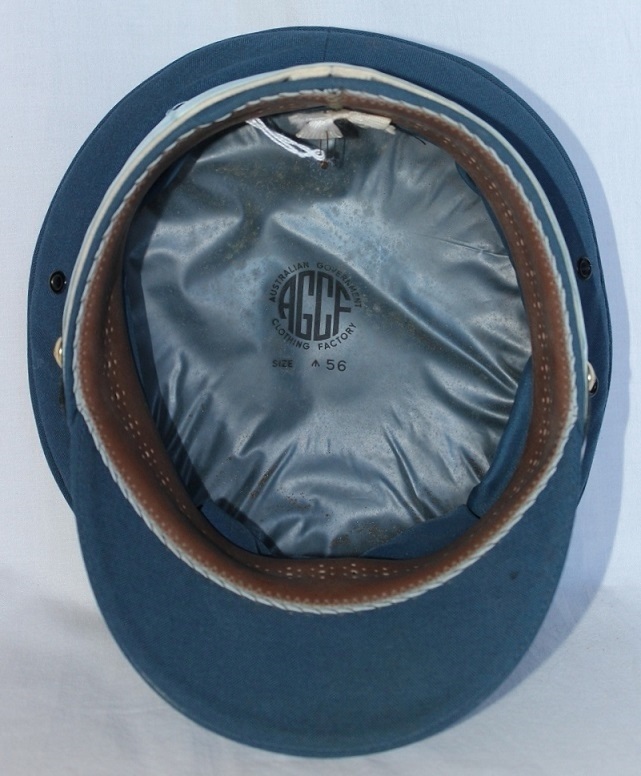 The cap is lined with a blue/grey material and is covered with thin plastic which is stamped Australian Government Clothing Factory (AGCF) size 7 arrow . The sweatband is foam backed vinyl, the hat band is black mohair and the vinyl chinstrap is held in place by 2 gold plastic RAAF buttons. The black peak has 1 row of gold embroidered laurel and the underside is green. H349. Gold bullion officers cap badge. H349. Blue/grey material liner with makers stamp. H363. H363. 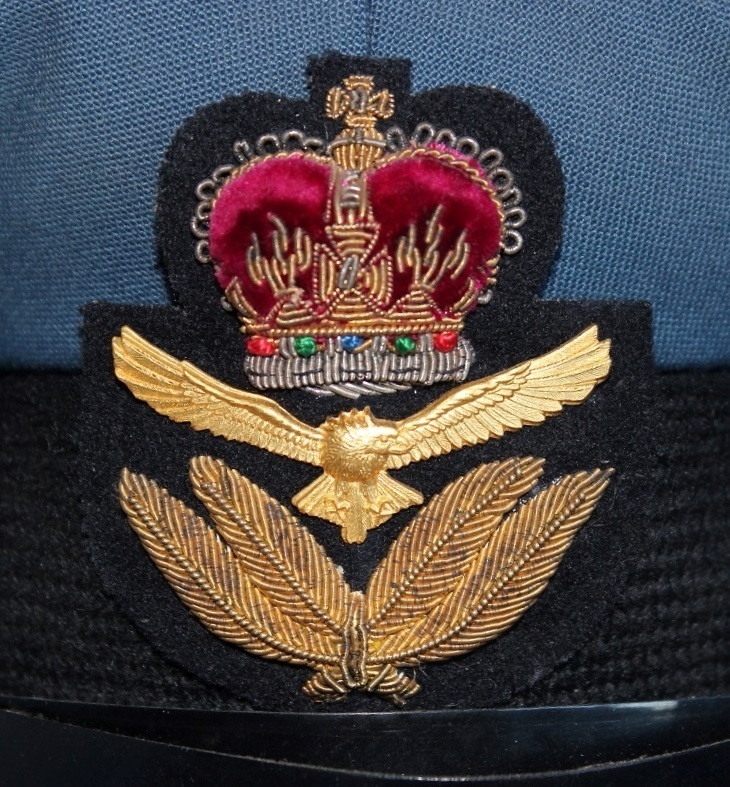 An unnamed Air Rank Officer service dress cap with a gold bullion officers cap badge. 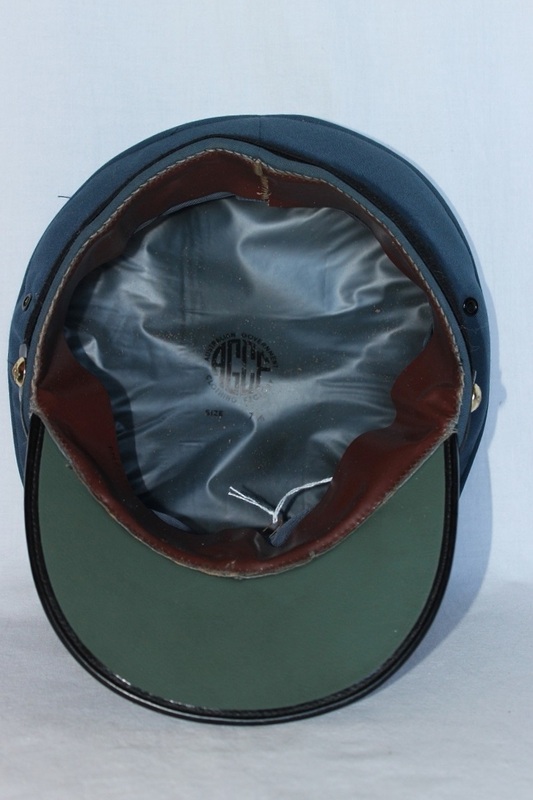 The cap is lined with a blue/grey material and is covered with thin plastic. 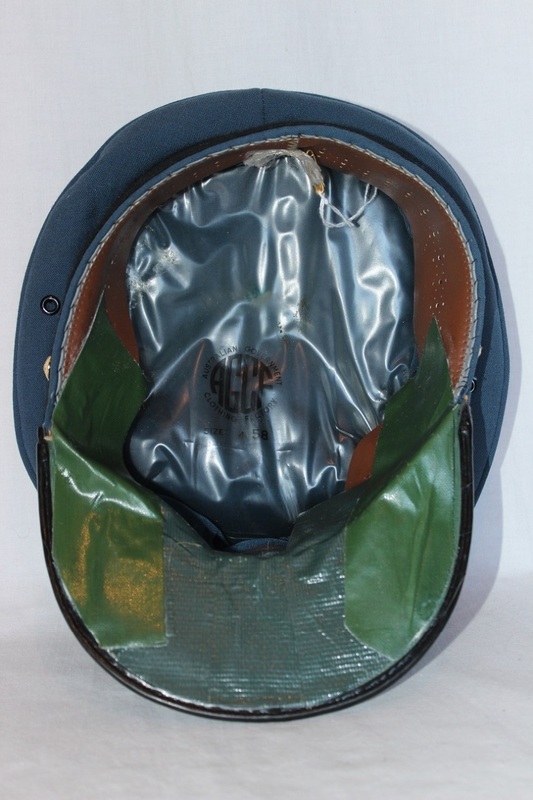 The sweatband is foam backed vinyl and has green cloth tape holding it to the peak, the hat band is black mohair and the vinyl chinstrap is held in place by 2 gold plastic RAAF buttons. The black peak has 2 rows of gold embroidered laurel and the underside is green. H363. A gold bullion officers cap badge. H363. Blue/grey material liner with makers stamp. H396. 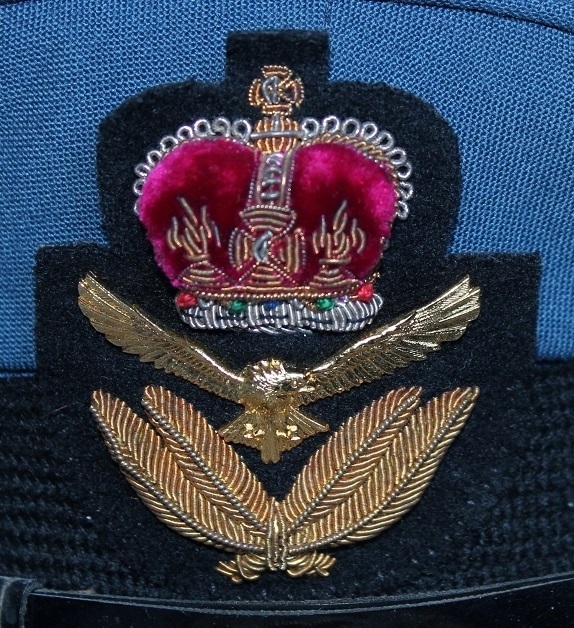 An unnamed women’s service dress ranks cap with an anodised airman’s cap badge. 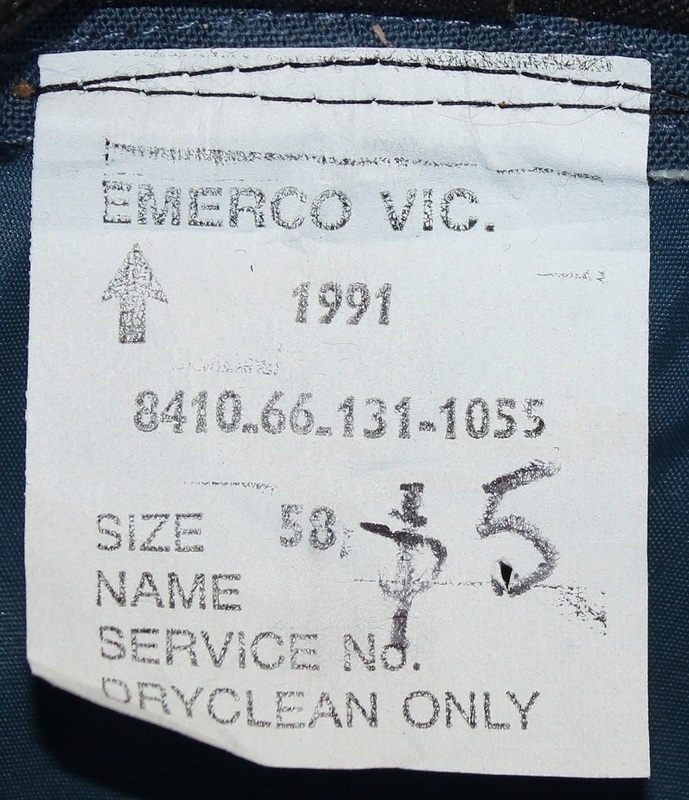 The cap is lined with a blue/grey material and has a white label sewn to the back that reads, Emerco Victoria arrow, 1991, stock number, size 58. H396. An anodised ranks cap badge held in place with a cable tie. H396. White cloth label sewn to back of hat. H449. 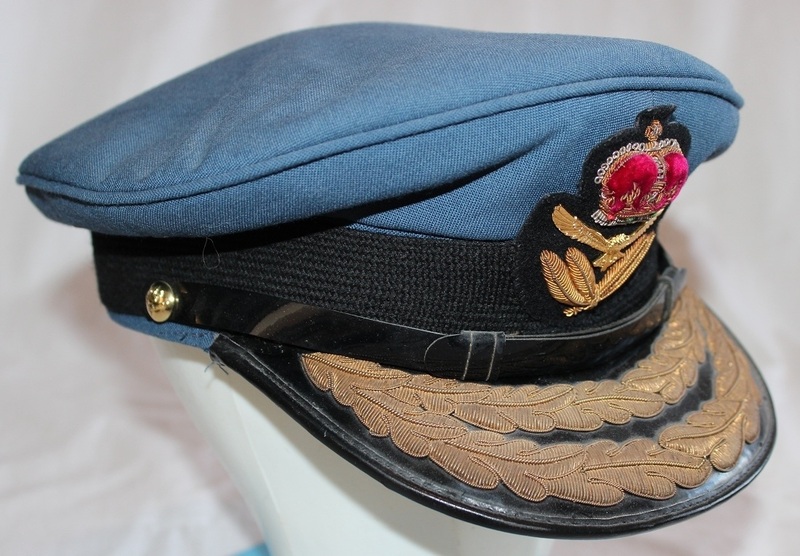 A women’s (WRAAF) service dress cap with a small gold bullion female officers cap badge. 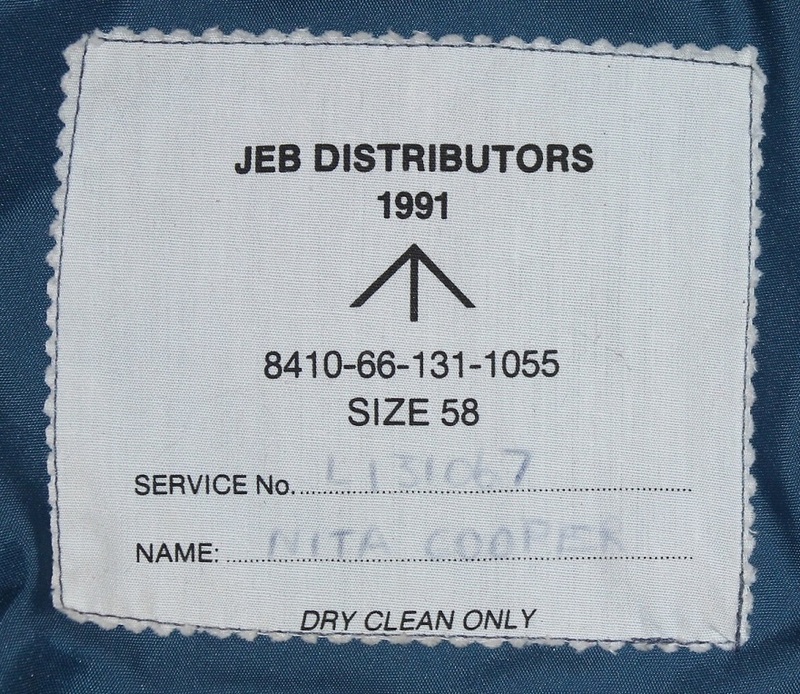 The cap is lined with a blue/grey material and has a white label sewn to the crown that reads, JEB Distributers 1991, arrow, stock number size 58, service number L131067 Nita Cooper. H449. 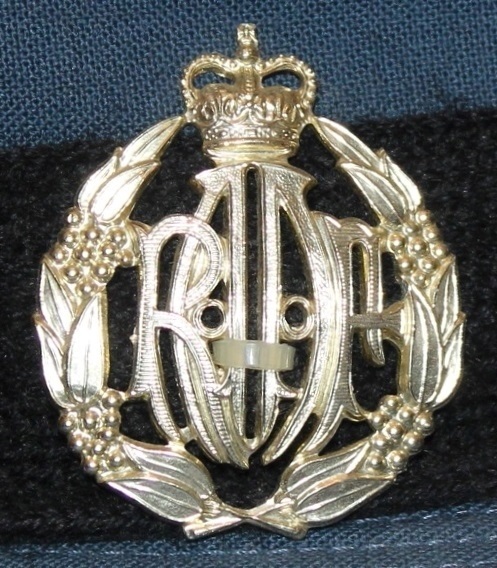 Small female officers gold bullion cap badge. H449. White cloth label sewn to crown of hat.